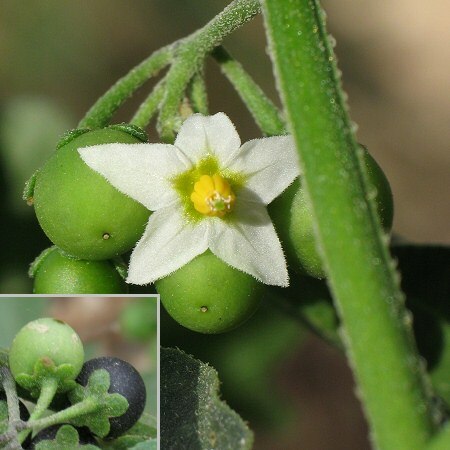 ﻿ Solanum nigrum (Black Nightshade) : MaltaWildPlants.com - the online Flora of the Maltese Islands. Subglabrous to villous annual up to 70 cm, with simple hairs; stems decumbent to erect. Leaves 2•5-7 × 2-4•5(-6) cm, ovate-rhombic to lanceolate, entire to sinuate-dentate. Cymes (3-)5- to 10-flowered, lax, solitary; peduncles (10-)14-30 mm, usually erecto-patent in fruit, the pedicels usually much shorter, recurved in fruit. Calyx 1-2•5 mm, slightly accrescent, deflexed or adhering to base of berry; lobes usually ovate. Corolla (8-)10-14(-18) mm in diameter, usually 1½-3 times as long as calyx, white. Anthers 1•5-2•5 mm, yellow. Berry 6-10 mm wide, usually wider than long, dull black or green; seeds 1•7-2•4 mm. Most of Europe, but doubtfully native in much of the north.